Do you struggle with perpetually flaky, dry, rough skin, no matter how much moisturizer you slather on? Caring for extremely dry skin goes beyond just lotions and creams. With a better understanding of what contributes to dryness, you can make meaningful adjustments to your skincare routine for softer, smoother, perfectly hydrated skin! Dry skin occurs when it can no longer retain its natural moisturizing factors or effectively hold on to moisturizing ingredients—in other words, it loses the ability to replenish itself. The culprits include over-cleansing (especially with bar soap), harsh ingredients, abrasive scrubs, cumulative unprotected sun exposure (daily SPF is a must! ), and many common elements in the air we’re exposed to on a daily basis. Winning the battle against dry, aggravated skin begins with your choice of a gentle but effective cleanser that leaves skin feeling soft and clean, never dry or tight. An ultra-soothing cleanser like our SKIN RECOVERY Softening Cream Cleanser can get the ball rolling toward healthier-looking, more resilient skin. This multi-action cleanser has a nourishing blend of plant oils and extremely mild, easy-to-rinse cleansing agents. Important advice: Avoid bar soaps and scrubs. These skin-aggravating products hurt the skin’s surface, reducing its ability to hold on to moisture. After cleansing, recharge your skin with our RESIST Advanced Replenishing Toner, which is loaded with superior hydrating and skin-replenishing ingredients. Adding these rejuvenating substances to very dry skin gives it exactly what it needs to start regaining moisture and safeguarding it from future moisture loss. Next step is to apply a moisturizing leave-on AHA (alpha hydrox acid) exfoliant such as RESIST Daily Smoothing Treatment 5% AHA. This gentle exfoliation can pave the way for your other products to further enrich very dry skin with the lasting moisture it needs to improve. After applying your leave-on exfoliant, you’ll love applying a few drops of our RESIST Moisture Renewal Oil Booster. Its exclusive blend of nine non-fragrant, antioxidant-packed plant oils brings soothing, moisture-rich relief to dull, dry skin. This small step can make a world of difference in replenishing hydration and reviving very dry skin to a luminous, radiant glow. The final step at night is to give skin the ultimate in moisture and enriched skin-restoring ingredients. Standard basic moisturizers and creams just won’t do it for this problem skin type; rather, it needs high-powered blends of essential lipids, ceramides, plant butters, and calming agents. For heavy-duty hydration with a luxurious feel, try our CLINICAL Ultra-Rich Moisturizer- great for sensitive skin, even for those with eczema. Your skin will be immediately comforted and cushioned from the environmental assault around you (such as low humidity heated air), locking the good stuff in and keeping the bad out. And, of course, during the day, your moisturizer should contain sunscreen rated SPF 30 or greater. Nothing is more important for skin than protecting it from daily UV light exposure (even on a cloudy day); unprotected UV exposure limits skin’s ability to hold moisture in and replenish the vital, healthy substances it needs. 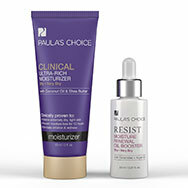 Paula’s Choice SKIN RECOVERY Daily Moisturizing Lotion SPF 30 is the ideal choice for dry skin. It’s hydrating enough to be used alone, but can also be worn over another moisturizer, booster, or serum if you want.